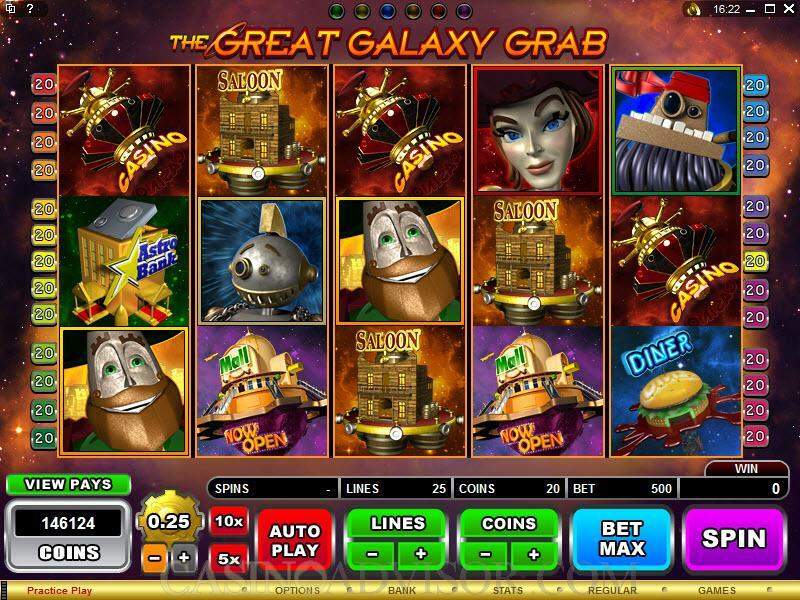 The Great Galaxy Grab is a unique and innovative slot released by Microgaming based on the galactic pirates theme. 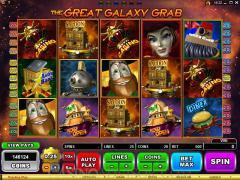 It has five reels, twenty-five paylines and a max bet of 500 coins. The uniqueness begins with the storyline that is told in the introductory movie. The characters in the story are Captain Bronzebeard, his wife Steel Scarlet, his space galleon Stella and his crew Dan, Rusty and Dozer. The other symbols on the reels are the places Bronzebeard visits like Mall, Casino, Saloon, Diner, Gas and Astrobank. And there is the Galaxy Grab Logo, which is both a wild symbol and a scatter symbol and triggers the free spin bonus round. Steel Scarlet is also a scatter symbol and triggers the Space Chase Feature. This feature takes the player through six successive different bonus games and completes the story. Before starting the game players will have to choose the coin denomination by operating the +/- signs below the coin denomination button. Coin denominations are 0.01, 0.02, 0.05, 0.10, 0.20 and 0.25. Players will also have to enable up to twenty-five paylines by operating the +/- signs below the LINES button. Winning combinations pay only if they occur in enabled paylines. Finally players will have to choose the number of coins per line by operating the +/- signs below the COINS/LINE button. 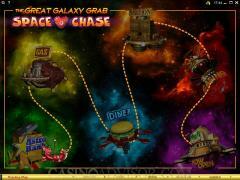 In The Great Galaxy Grab, players can wager up to 20 coins per line. Once the settings have been completed the game can be started by clicking the SPIN button. The Galaxy Grab Logo is the wild symbol. It doubles payouts but does not offer a fixed jackpot. Three or more symbols scattered on the reels trigger the free spins bonus round, which offers 10 free spins at tripled payouts with the possibility of re-triggering. Three or more Steel Scarlet symbols trigger the Space Chase. This consists of six different bonus rounds each associated with a particular location offered in sequence. The game remembers the last location visited even if the game is disconnected. In the Bank Bonus players pick 6 Astro Doubloons out of 12 to create a spending balance. In the Refuel Bonus player have to match 4 same fuel logos. In the Diner Bonus players have to choose from 3 orders but can change their mind twice. In the Saloon Bonus players decide which card is higher to get a multiplier and then complete a poker hand. In the Casino Bonus players spin the big wheel for multipliers and re-spins. And in the Mall Bonus they shop till their money runs out. 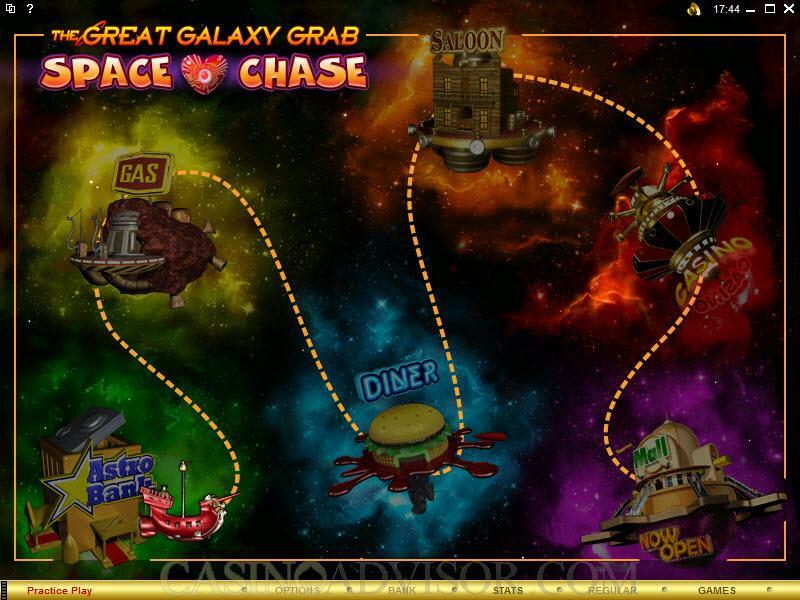 In The Great Galaxy Grab players can win up to 36,350.00 in the base game, 11,000 in bonuses and a whopping 109,050.00 in Free Spins. Interested in reading more detailed information about The Great Galaxy Grab? If so Click Here for more details.